Upon the severe shortage of five-in-one Pentaxim and six-in-one Hexa-infarix vaccine in medical clinics, the Ministry of Health yesterday sent its urgent document to its sub-departments, Pasteur institutes and hospitals about implementing expanded immunization program in medical clinics which provide serviced vaccinations. Accordingly, the Ministry proposed increasing information of the benefit and quality of the vaccinations in a bid to encourage parents to take their children to medical clinics for immunization following the schedule. Health departments should instruct state medical clinics which provide serviced vaccinations along with vaccine in the National Expanded Immunization Program to parents and let them choose which ones should take for their children. Health authorities must increase supervision over the act of getting profits from serviced vaccinations. Hospital leaders will be punished if their clinics are unable to provide enough vaccines in the national expanded immunization program. On the same day, the Department of Preventive Medicine under the Ministry of Health issued a warning over vaccination. As per the warning, the Department showed that parents should take their two month old, three month old and four month old children to medical clinics for full immunization including three shots of five-in-one vaccine Quinvaxem. Parents should not wait for have-to-pay vaccine. The Department affirmed the vaccine in the national program is safe and effective. Since many parents just believed in the quality of have-to-pay vaccine, they decided to wait for the vaccine, said the Department. However, the vaccine manufacturers announced that they will limit the provision of Hexa-infarix and Pentaxim with around 300,000 dozes of Hexa-infarix and 250,000 dozes of Pentaxim. 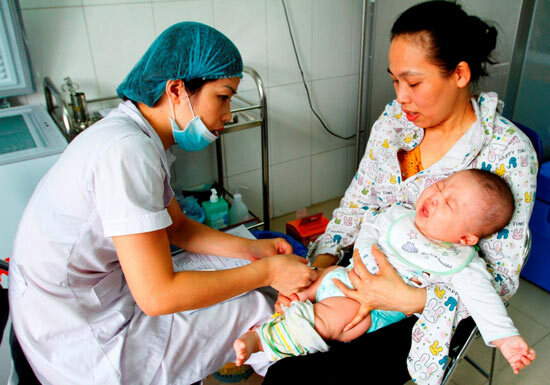 Meantime, Vietnam has around 1.6 million newly born babies who needs immunization with total 4.8 million dozen vaccines against whooping cough. Accordingly, waiting for have-to-pay vaccine will cause danger to children, leading to high rate of infected children and deaths for children under six month old due to whooping cough. In reality, many children received free-of-charge vaccine from the National Expanded Immunization Program and just a few children in big cities such as Hanoi and Ho Chi Minh City injected with have-to-pay vaccines. Infanrix Hexa vaccine is used in children to prevent six diseases including diphtheria, tetanus (lockjaw), whooping cough, hepatitis B, poliomyelitis, and Haemophilus influenza type b while the first 5-in-1 combination vaccine Pentaxim is against diphtheria, tetanus, pertussis, polio and Haemophilus influenzae type b.